Sir Ben Ainslie's British team have been cheered to victory in the America's Cup sailing in Portsmouth - by Prince William and Kate, as well as thousands of supporters. The Duke and Duchess of Cambridge perched on the front of a high-speed catamaran as they cheered on Sir Ben Ainslie's America's Cup team to victory. 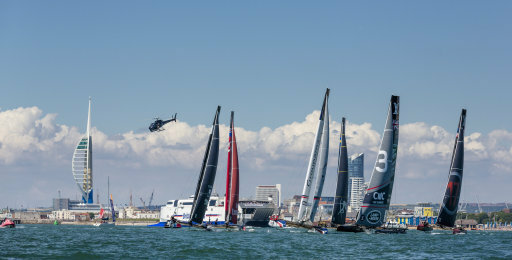 The royal couple joined thousands of spectators to support Ainslie's Land Rover BAR team in the Portsmouth leg of the America's Cup World Series (ACWS). At the end of the final race which secured Land Rover BAR's victory, the couple's boat, bearing the royal standard, sailed alongside Sir Ben's catamaran as the team and their support vessel cheered and began their celebrations. Hundreds of thousands of people watched six teams racing catamarans that fly just above the water. The World Series races lead up to the America's Cup itself in Bermuda next year. The series features the best sailors in the world competing on AC45F (45 foot foiling) catamarans. The circuit has traveled to a number of locations around the world in 2015 and 2016. When the teams arrived back at the event village, William and Kate presented the winner's trophy and medals to Sir Ben and his team in front of cheering crowds. The teams were competing for points to take forward to the finals being held in Bermuda 2017 and Sir Ben is hoping to be the first British team to win the prestigious event in its 165-year history. Oracle Team USA are the defending champions.